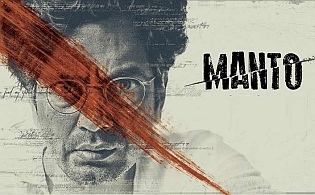 Director Nandita Das’ Manto is a poignant and hard-hitting biopic about the controversial, Indo-Pakistani, Urdu short-story writer Sadat Hassan Manto. It is her tribute to Manto, albeit one she renders with honesty as she presents the celebrated writer with all his failings and greatness. The film opens in Mumbai where a young and raring-to-go Manto is slowly but surely making his presence felt in the Indian film Industry. With the Partition breaking out, circumstances compel Manto to move to Pakistan and his life changes. The Director succeeds in allowing the audience to be privy to the life of this author who lives in Lahore but has his heart belonging to Mumbai. The narrative flows smoothly and the origination of some of his short stories like “Toba Tek Singh”, “Khol Do” and “Thanda Gosht” are successfully depicted.